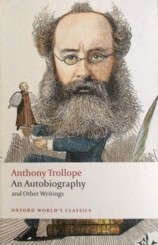 I was very pleased to be sent a review copy of this new edition of Anthony Trollope's Autobiography, as I loved it when I read it a few years ago. Trollope is one of my favourite authors & his autobiography is a portrait of a lovable man who survived a miserable childhood & created a happy life for himself, both personally & professionally as a novelist. He was also a very practical man, who kept working in the Post Office for many years while writing his novels. He didn't wait for inspiration to strike but was woken by a servant with a cup of coffee early every morning & wrote his quota before breakfast & heading off to work. This matter of fact attitude to writing & his descriptions of finishing one book on Monday & starting the next on Tuesday, dismayed some early reviewers of the book. His reputation didn't suffer any lasting damage though, as his novels have stayed in print & were among the most popular books (alongside detective novels) read in air raid shelters during the Blitz. I've linked to my review above but I can't resist quoting this passage again where Trollope answers those critics who think that a writer should live a rarefied life of the mind. Practical & level-headed indeed. I am well aware that there are many who think that an author in his authorship should not regard money,- nor a painter, or sculptor, or composer in his art. I do not know that this unnatural self-sacrifice is supposed to extend itself further. A barrister, a clergyman, a doctor, an engineer, even actors and architects, may without disgrace follow the bent of human nature, and endeavour to fill their bellies and clothe their backs, and also those of their wives and children, as comfortably as they can by the exercise of their abilities and their crafts. This new edition also includes some of Trollope's literary criticism, principally a lecture that he gave called On English Prose Fiction as a Rational Amusement. In the lecture, Trollope surveys English novels from the Elizabethan beginnings, through the giants of the 18th century to the present day, although he doesn't mention any living novelists. He divides fiction writers into two camps - before & after Sir Walter Scott, whose work he sees as a high water mark for the art. Trollope declares that novel reading can not be bad for young people, one of the debates that had gone on for as long as novels had been published. Although he is dismissive of the Gothic novels of Ann Radcliffe & the even earlier work of Defoe, after Scott, there can be no hesitation in allowing the young to read fiction. And I will begin by suggesting that if novel-reading be bad for young people, it is bad also for the old. I am disposed to think that the distinction which so many of us make in this matter is similar in its nature to that which we have instituted between the one-o'clock and the seven o'clock dinner. We who are the elders have the richer puddings and the more piquant sauces,- not because they agree with us better than with our children, but because we are able to get them. When I hear of ladies beginning to read French novels after they are married, I always think of the privilege which grown-up people have in spoiling their digestive organs. ... If novels, or any classes of novels, be bad for young women, than they are also bad for young men. Truth let there be;- truth of description, truth of character, human truth as to men and women. If there be such truth I do not know that a novel can be too sensational. With Mr and Mrs Bennet and Lady Catherine de Burgh we are quite at home. With the Mansfields and the Crofts we have our sympathies and antipathies with the surrounding families in our own village or our own circle. The return of Sir Thomas is as when our own father came upon us in our juvenile delinquencies; and we can hardly help believing that we ourselves received Mr Collins' letters each with one of Rowland Hill's penny stamps in the corner of the envelope. Even here, Trollope can't resist a mention of the Post Office. He wasn't quite so fond of Emma. Her conduct to her friend Harriet,- her assumed experience and real ignorance of human nature - are terribly true; but nowadays we dare not make our heroines so little. Her weaknesses are all plain to us, but of her strengths we are only told; and even at the last we hardly know why Mr Knightley loves her. The Introduction by Nicholas Shrimpton discusses the reception of the Autobiography, which was published after Trollope's death, & the way that Trollope's revelations about his working habits & his almost entire effacement of his personal life affected his reputation among critics. Oxford University Press kindly sent me a review copy of An Autobiography and other writings. After reading Doctor Thorne I imagined he admired Jane Austen, but it's fun to know that I guessed correctly! Yes, Austen wasn't terribly well-known in the later 19th century, I think her reputation rose again with the publication of her nephew's Memoir, but it's good to know that Trollope enjoyed her books. I have a Penguin edition of The Autobiography, but I don't think I'm going to be able to resist this new edition. The extra critical articles are definitely worth the cost of a new copy! Somewhat shamefacedly, I have to admit that although I love Trollope's novels I've never read his autobiography, and know nothing about his life. But your review has whetted my appetite - I must find ouit more. The Autobiography is a fascinating book for what it does & doesn't say. He barely mentions his wife although they were apparently very happy. The stories of his childhood are just heartbreaking & I enjoyed all the information about his working methods. He definitely wasn't an overnight success as a novelist. Like Christine above, I've never actually read about Trollope though I know his work, this one will go on my Library list, it sounds intriguing. 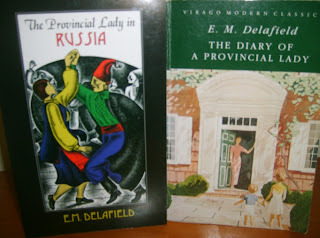 I always love reading about writers & Trollope is such a lovable man.